Before someone helpfully leaps in and tells me that dogs aren't just for Christmas, I'll explain that we have been toying with the idea of a puppy for many months. I favoured something large and robust. Daddy Downs Side Up thought something tiny would be easier to manage and less threatening to the girls. He was right. 3 days after Christmas a friends forwarded an ad for Chihuahuas that she had seen locally. That, as they say, was that. And the rest, as the saying goes, is history. The madness and travel of Christmas had passed. We were ready and the ideal dog was waiting. 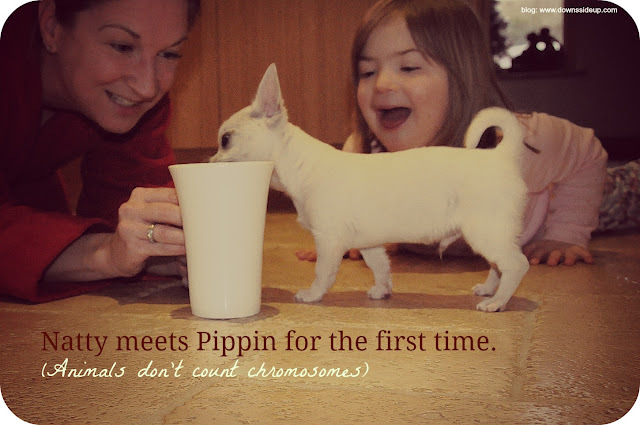 Here is a *CUTE PIC KLAXON* photo of Natty meeting her dog Pippin for the first time. What has been lovliest is that she is no longer the tiniest member of the G Unit, the one who needs toiletting help and explanations of how life works. She is now explaining and dictating to the micro-puppy, who, in DS terms, is just the right size for her to manage.